Sometimes it happens that life delivers inspiration at exactly the right time without me even actively looking. I really like when this happens, since it feels like someone switched on a light bulb in my brain and the jungle of ideas in my head that could make up a new project suddenly magically unsnarls. Today this Aha-Moment was given to me by Janne Kyttanen who decided to follow me on Twitter. I had never heard of him and I looked him up… and I was stunned. 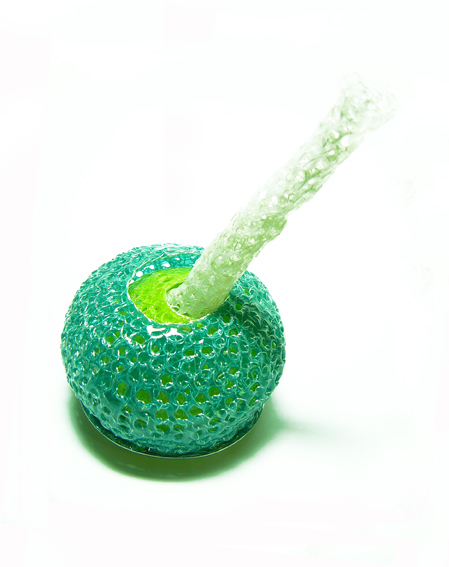 He is a designer, based in the Netherlands, who is very much interested in 3D printing. He started to investigate and work with this technology since the mid 90’s and his portfolio is very impressive. 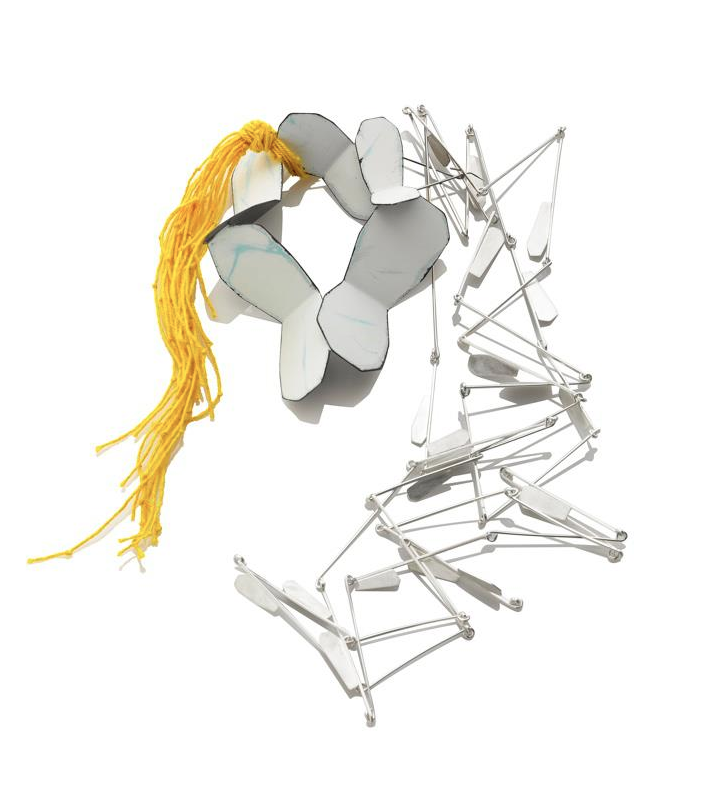 From his designs, over to founding his own business ‘3D Systems‘ to collaborations with shoe-designers, interior architects, jewellery artists (like Ted Noten) etc. Janne really likes to dip into multiple design disciplines. A fact that I find highly refreshing and inspirational. There are quite a few things that kept my mind busy lately. One thing that I have been thinking about for quite a while is that I would like to have my artistic work run in a new direction again and 3D printing is one technique that fascinates me. Back when I was still living in Shanghai, I purchased a 3D printer from Makible, a start-up company based in Hong Kong that offers a very price-tag friendly 3D printer, the MakiBox. At the time when I purchased the printer, I was not aware that they were just starting of (completely my misunderstanding) and that it would take some time for the product to be finished, so I could not yet try to work with a 3D printer. But some things are worth the wait and now, almost two years later, it seems like my MakiBox is finally in the post and I should receive it any time now. I so cannot wait! Another thing is that recently I feel the urge to explore other art and design fields. For the last ten years I have mainly been working in jewellery and as of lately I feel like the small scale almost seems to ‘suffocate’ me from now and then. In order to get my mind free, I find it helps to work big sometimes or do something completely unrelated. (This is also one reason why I decided not to go to see the Schmuck 2014 exhibition in Munich this time.) Right now, I would love to indulge in making chandeliers and lamps and I would like to dive into sculptural art. But to get back to 3D printing… As mentioned before, I am fascinated by the technique but I find it very controversy at the same time. 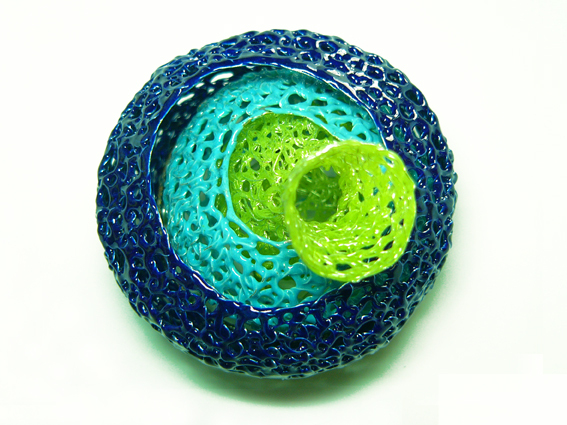 A lot of artists have dipped into the field already, like jeweler Arthur Hash or the design team from Nervous System and I admire their work a lot. But for me, I love making things by hand, it forms an essential part of my designing process. Using a technology that is solely based on a machine fabricating an idea might not be enough for my bench-experience and it also raises a lot of questions as to how the making process in art and craft should and can look like. Does the artificial making process ‘water down’ the quality of work, since a 3D printer might soon be a house-hold stable in every home for everyone to use? Will art soon be something that every person can do by the mouse-click? Can suddenly everyone be an artist? Or will in the end the artistic mind take over and even in such an easy, approachable technology, the creative idea will determine the quality and level of the work? I assume the latter will be the case. In order to create objects, one needs to have a mind that can think accordingly but the question of whether art should actually be made by the artist and not necessarily a machine will remain. Also, is the sole idea of a piece of work enough? Individuality might get lost in the machine-making process, uniformity might take over. But then again, this can also be a very interesting approach to a body of work. 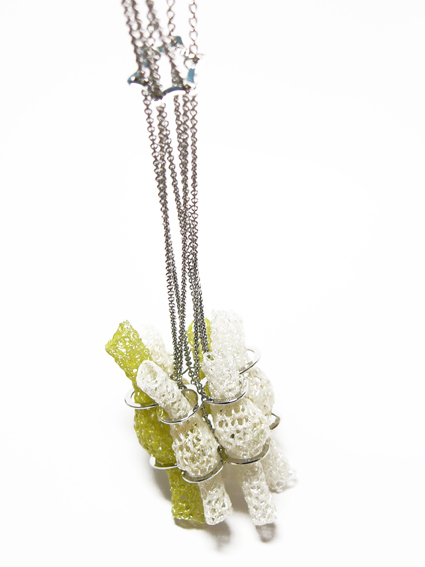 Nervous System, Kinematics Jewelry in 3D printed nylon. In fact, this approach is one point that I am quite interested in at the moment. I have a few ideas turning around the symbiosis of hand-made and 3D printed structures. I think that combining two different forms of making, in their process and the choice of material, will add a very interesting contrast to my future pieces. Another thing that I will add is a new topic that the work will turn around. In the spirit of contrast, that has always been a major motivator in my work, I have recently looked into the relationship of nature and humans again. This is an issue that has always been in the back of my mind. (Have a look at my ‘Booming Blooming‘ and ‘Globalores‘ series.) In my opinion, the modern human primarily takes from nature and does not give much back. There are major man-made natural catastrophes happening all around the globe, gene-manipulation in plants and animals becomes bigger and bigger etc. … and all in the name of consumerism without people thinking about the consequences. What will happen if humans ‘win’ and nature is gone at some point? Will we have to fabricate nature too? Will nature be a reminiscent of the past with all those new technologies ‘improving’ the natural ways of being? This image was recently sent to me by my sister-in-law. 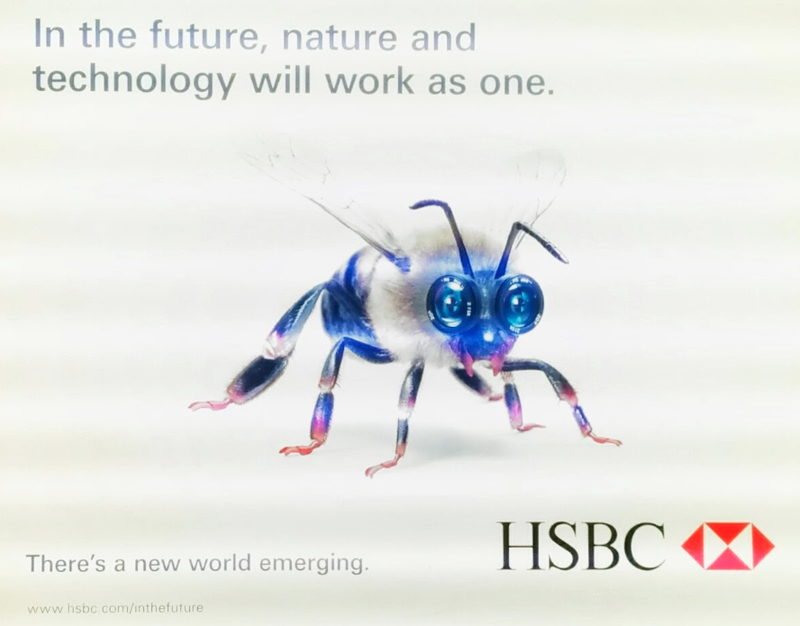 Will nature and technology work as one or will technology take over nature? I will see where this path will lead me. It might take a while before I can show some actual finished pieces. Since I have never 3D printed anything before, I am not familiar with any 3D modeling programs. I am good in Illustrator but learning 3D will be a new task that might take a while. If anyone knows of any good, easy-to-learn and free 3D programs, please let me know! I appreciate all the help I can get. But for now, thank you Janne Kyttanen for following me on Twitter this morning! Great news! 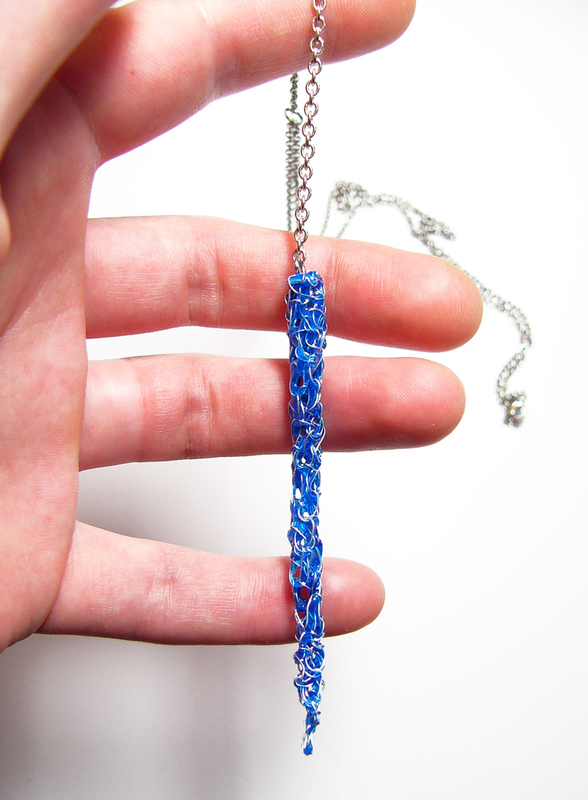 The new ProonK ‘Lace’ Collection is now available on Etsy. 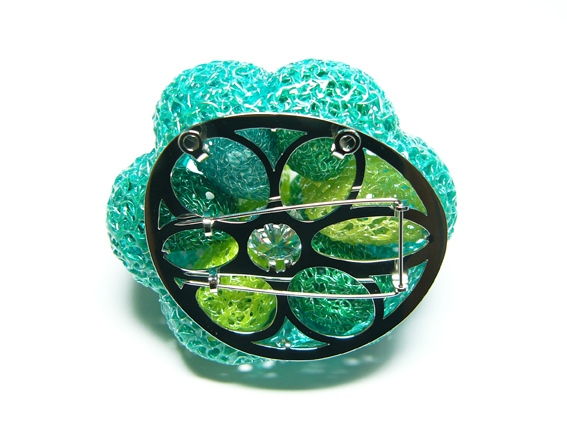 The pieces are made from hand-crocheted fine silver wire and kiln-fired enamel. All jewellery is entirely hand made by myself from beginning to finish in the Utica, NY studio. 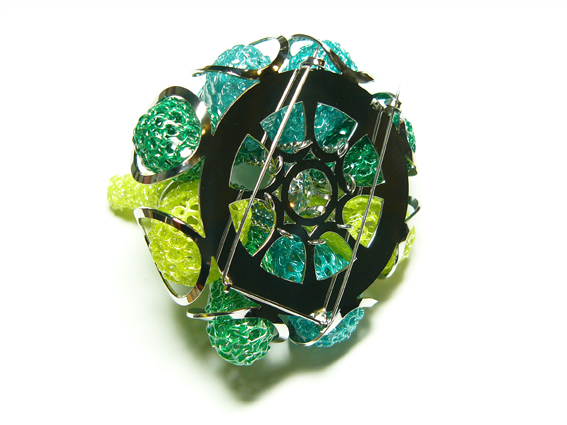 Due to the nature of the crochet and the enamel, every piece looks slightly different, a fact that I am very happy about. I like to believe that this ensures individuality in the pieces. They all have their own little character. 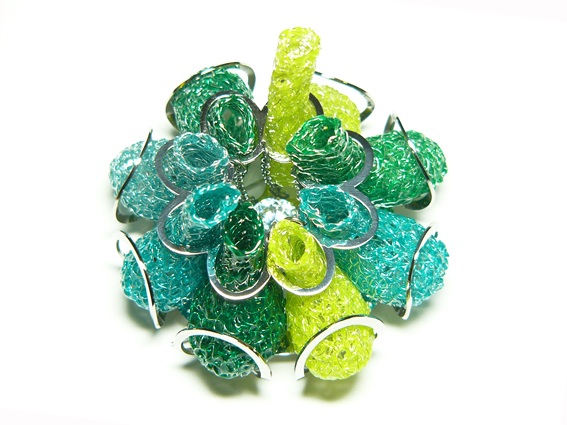 The actual collection contains earrings, necklaces, rings, cufflinks and I am constantly working to enlarge the range. Inspiration comes from organic natural shapes, like chilis, mushrooms and buds but also from architectural elements and insects. My latest prototypes took me back to my fascination with bugs and flies. This time, I wanted to create shapes that resembled their idols but would not have a ‘creepy’ character to them. 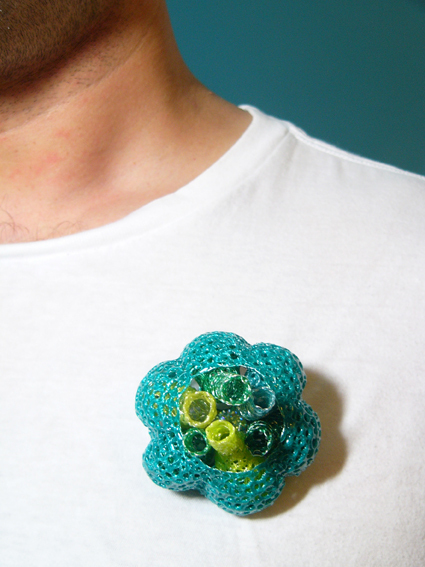 It is also important to me to experiment with the crocheted mesh and the enamel. I find that once the crochet-structure is enameled, it resembles window enamel, almost like a modern take to the Jugendstil jewellery of the early 1900’s. I have always been a great admirer of René Lalique. So, for my insect inspiration, I wanted to find a way to connect the crochet-mesh and the enamel with a frame. I am very happy with the results of my experimentation, since the ‘wings’ of the insects really look like little windows that create amazing shadows and new colours once they overlap. There will be more experiments to come soon. I have quite a few more ideas I would like to try. If you are interested in purchasing pieces from the new ProonK ‘Lace’ Collection please have a look at my Etsy ProonK Shop. I very much hope you enjoy my new designs!Commissions are always welcome. 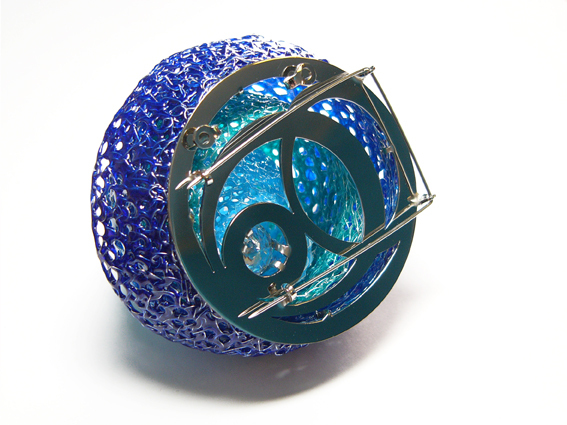 ‘Lace Button’ Earrings in Water Blue and Light Blue Enamel. 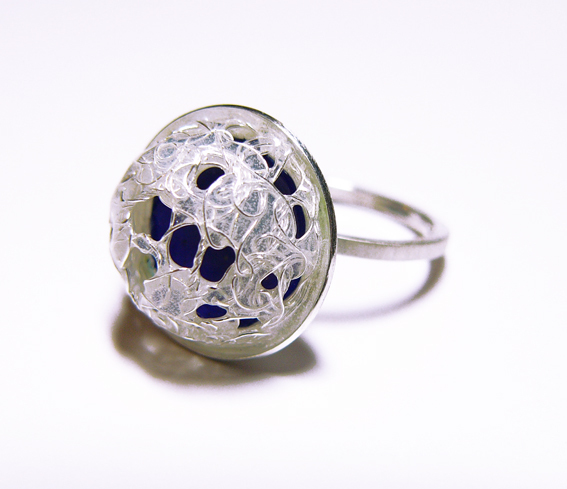 ‘Lace Button’ Ring in White and Dark Blue Enamel. 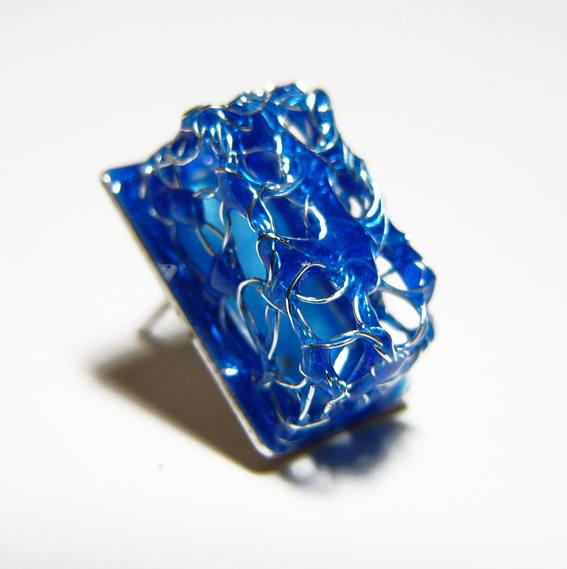 ‘Lace Box’ Earrrings in Water Blue Enamel. 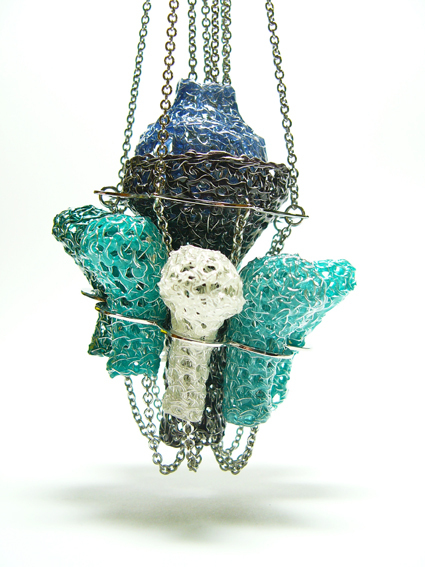 ‘Lace Chili’ Necklace in Water Blue Enamel. 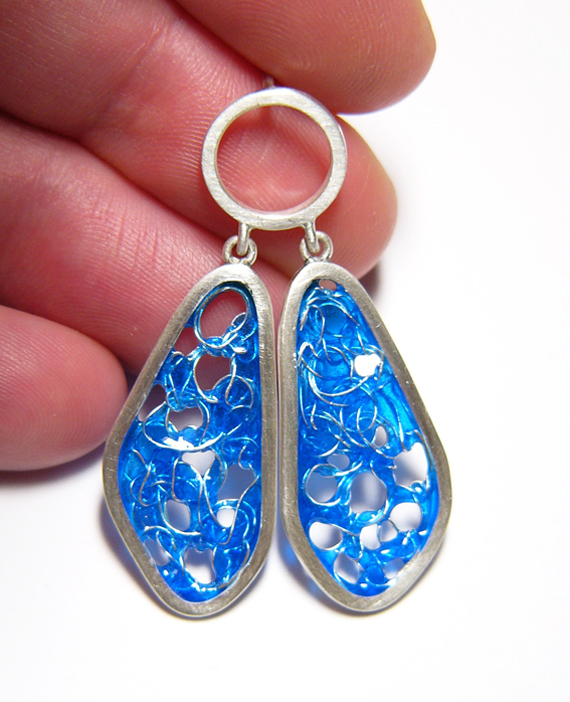 ‘Lace Bell’ Earrings in Water Blue Enamel. ‘Lace Button Chili’ Earrings in Peppermint and Orange Enamel. ‘Lace Button Bud’ Earrings in Light Blue and White Enamel. 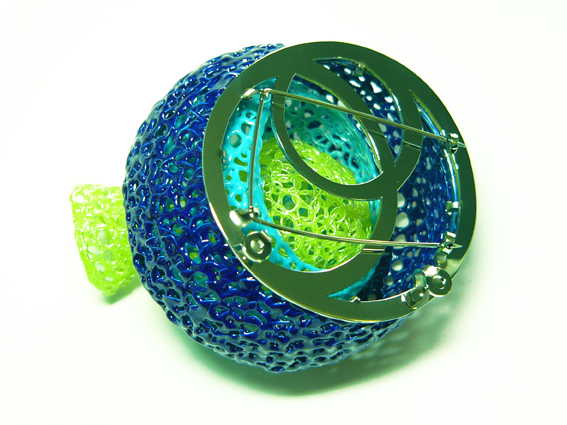 ‘Lace Button Bell’ Earrings in Water Blue and Lime Green Enamel. 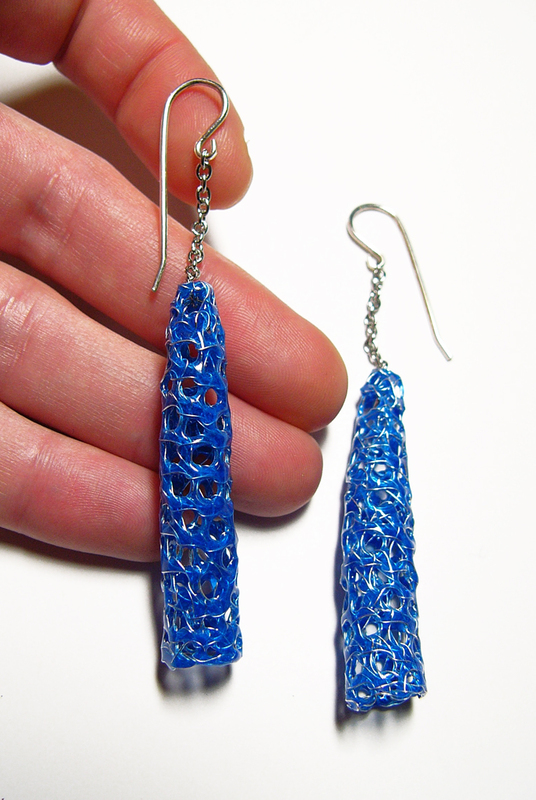 ‘Lace DragonBug’ Earrings in Water Blue Enamel. 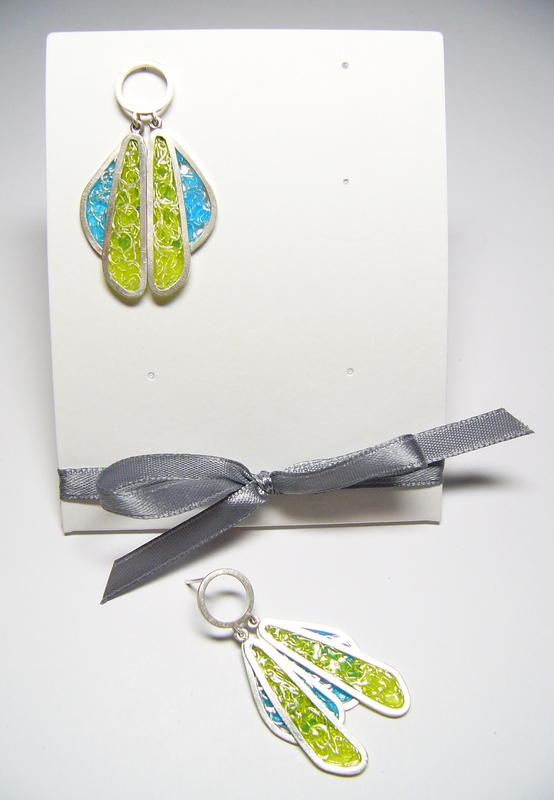 ‘Lace DragonFly’ Earrings with Light blue and Lime Green Enamel. First, I hope you all had a great start in the New Year and that the ‘Year of the Horse’ will take you on a memorable ride in 2014! I apologise for not having updated this blog in a while. For the last few weeks, I tried to concentrate more on ProonK, especially with all the Christmas business coming up and the artistic side of my making fell off the wagon a little. Yesterday though was a great reminder of why I love to make Art Jewellery: I went to a lecture of Amy Tavern at the PrattMWP Institute yesterday afternoon. The lecture was very interesting. Amy talked about her upbringing in New York State, her college years and studies, her unusual way to recognising jewellery was her passion, over to more studies, living in Portland Oregon, starting off making mainly production work until she realised that the artistic aspect was missing for her over to her work from the beginnings to now, her artist residency in Iceland and travels to Europe and finally her current life back at home with the family. I always find that listening to other people talk about their work has a very uplifting effect on me. I admire many makers for what they are doing and what they have done in their work. Seeing the paths other people took to get where they are is very inspirational. Meeting and talking to fellow artists is the best support system one can think of. It was great meeting Amy yesterday and chatting about bits and bobs. It really is crucial to talk about work to keep moving forward. After my meeting with Amy, I felt very inspired and I decided to use the evening to revisit the basics of making to get a fresh perspective on things: Increasing knowledge and finding new inspiration. I felt very energised last night, so I ordered eight new books online (two were mentioned in Amy’s lecture) and I went through my bookshelf to pull out all the books that I either started to read or always wanted to read. I also unwrapped my camera. I have a very special relationship with it: It is a Rolleicord double-lens camera from 1957 and I got it from Ebay when I was 18. It is called James. The reason I got this old-timer was because I am not a huge fan of digital photography. For some reason it just does not feel right pushing a button and the camera does all the work for you. I like the old fashioned handling of it and the feeling of actually having ‘made’ something. So, James is ready to go and I hope that I can take him out for a walk over the weekend. 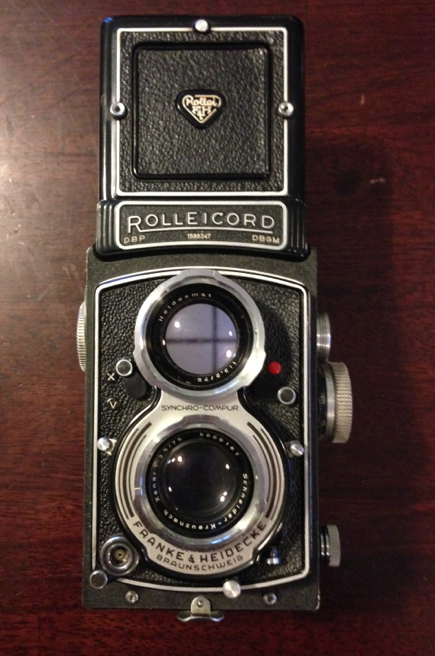 James, the 1957 Rolleicord camera. 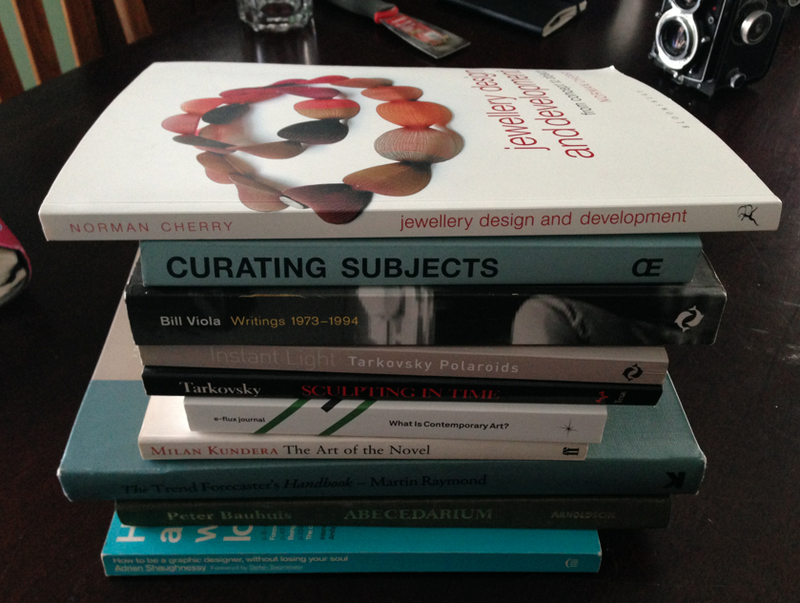 Here is also a list of the books I found in my shelf that I intend to read in the next few weeks/months, in case you are interested in good Art & Design books. I might write reviews on a few of them to let you know why I believe they are a great read. Thank you for reading. I always appreciate your input and comments. Again, it has been a while… and it has been quite an up and down from trying to find capable suppliers for ProonK, having my tonsils removed to frantically trying to get more pieces done for another yearly Schmuck-exhibition-application… and of course quite a few other things in between. Due to my tonsillectomy, my life had been pretty much on hold for two weeks. The only things I was willing and capable (yeah painkillers) to do were watching TV and knitting socks. It was a strange time on the sofa, going from a very tight jewellery making routine to almost nothing. It makes one wonder and think a lot. The body is an interesting but fragile thing. It needs to be taken care of … and pampered. Maybe this is the most valuable reason for the existence of jewellery. Body adornment, yes. Statement piece, yes. But maybe even more important, make yourself feel better in any possible way. Now, there are a lot of new and interesting ideas in my head, paired with a little bit of procrastination. It is difficult to get back into a routine after a longer period of time. A lot of thought, a lot of doubt. But one will not find without seeking, so all that can be done is to have a look back, pick it all up again and to re-evaluate where one left off. So, here they are, my most recent pieces, including a brief attempt to explain and analyse. The focus of the series ‘Onions’ turns around layers and cells as well as the interaction and movement of those single parts. The finished objects are worked in a way that they have the possibility to move freely and act with their wearer without falling into pieces when being worn on the body. The ‘Onions’ form language is mainly influenced by the imagery of onion and garlic plants and a diversity of organic cell structures. Like their natural paragons, every layer and cell knows to exist as a single form but at the same time it can act as a part of a group to shape the final object. Every single element makes up an important part of the piece that in addition has the possibility to express itself through free movement. This symbiosis of single element, group and movement fascinates me a lot. 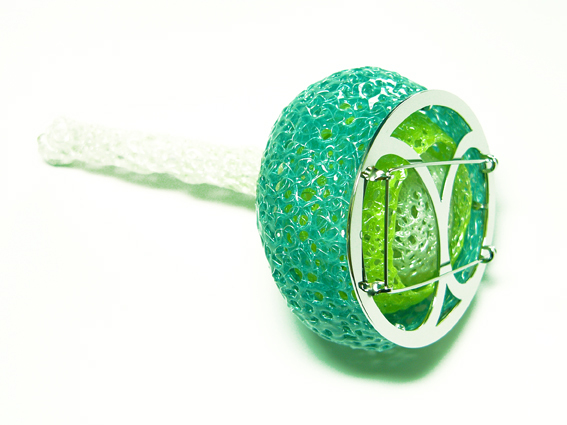 The layers and cells of the ‘Onions’ pieces are made of hand-crocheted silver wire that has been coated with several layers of enamel. The crocheting technique gives the pieces a nostalgic touch that comes along with ideas of descent and growth. The works show traces of origin and development that unites the viewer with the past and the future. 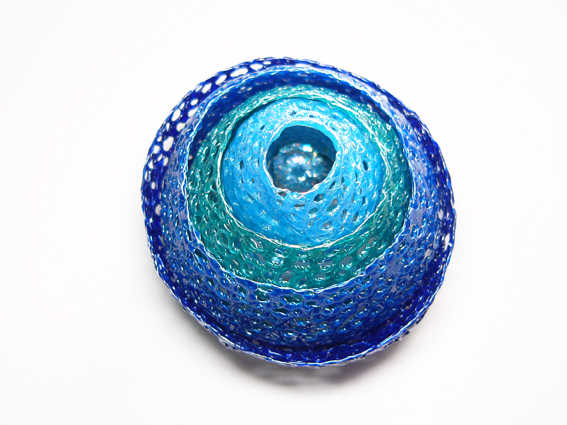 Additionally, the single element’s crocheted structure gives insights from one cell and layer to the other and veils form and colour of the general object. An illusion of a set shape is created that can change any time with the slightest form of movement. The body in its motion turns into an active part of the general construct. 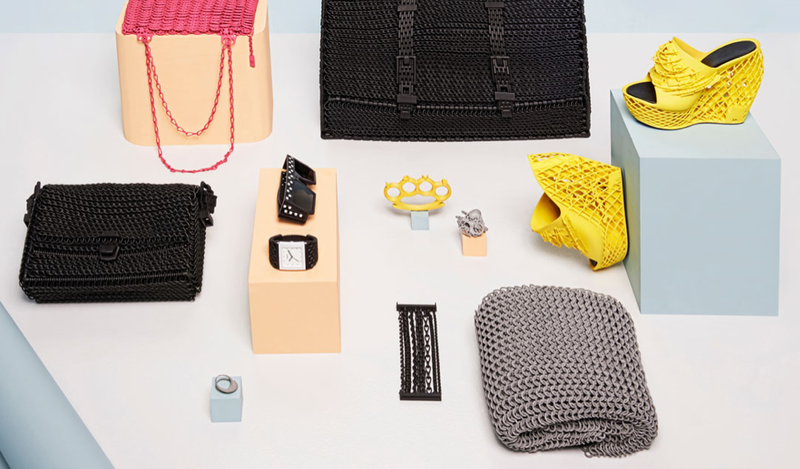 All pieces are made in a way that enables the inside layers and single cells to move when being worn. Nothing is set in place.